What’s the Difference Between a Facebook Business Page and a Personal Profile? This is one of the most common mistakes funeral professionals make on Facebook and it’s a big one. I talk to a lot of funeral directors about social media, Facebook in particular. There is simply no better way to represent your funeral business than on Facebook. Facebook is HUGE, and it’s growing by the minute. It has a lot of moving parts. This can tend to generate some confusion for those who do not spend a lot of time engaging online. One of the big areas of confusion revolves around how best to represent your funeral home on Facebook. Often, a funeral home owner tells me she tried to create a page for her funeral home, but the steps involved in setting up the page didn’t make sense. This is probably because she was trying to use a personal profile account to set up a business presence. 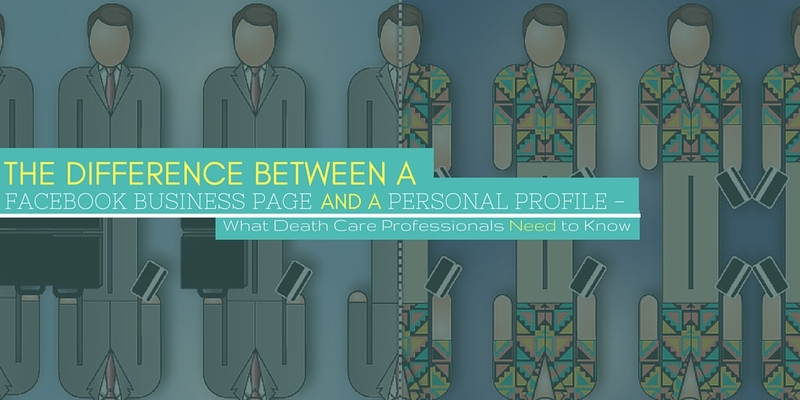 (You must have a personal profile to create a business Page – but many funeral professionals are also trying to set up a profile for the funeral home instead of a business Page. Keep reading – we will explain). There are two ways you can represent yourself on Facebook: through creating a personal Profile and by creating a Business Page. It’s important to understand the differences between the two in order to effectively manage your presence on the social network. A Facebook Personal Profile is just what its name implies…it’s how an individual represents himself or herself in Facebook. The Profile is not designed for businesses, so its options are restrictive toward commercial uses – promoting products or engaging customers. In fact, using a Profile to share for-profit content is actually a violation of Facebook’s Terms of Service and can result in deletion of the account. A Facebook Business Page, on the other hand, is intended for commercial use. It is a business friendly account that represents a company or organization. It looks similar to a Facebook Profile, but it offers unique tools for managing and tracking engagement. Some of the confusion lies in the fact that you DO need a Facebook Profile to create and manage a Facebook Business Page. This means you will have two pages to oversee; both a personal Profile and the business oriented Business Page. Once you create a Profile, you have a choice of the type/category of Business Page you can create. Each category features different options. Of course, you will choose to create a local business page. Once you do so, you are prompted to add information such as a short description of the business, your business website, email address, physical address, phone number, a map, check-in information, and a ratings/review section. To get started, go to http://facebook.com and follow the steps to sign up. It’s a fairly simple process, and the onscreen prompts will lead you step by step. In addition to setting up a Profile, you will see links to options for setting up a page for a “celebrity, band, or business.” Again, just follow the on screen prompts to set up a Business Page. We’ve provided many other helpful Facebook management tips and suggestions on our blog pages at https://disruptmedia.co/blog/ and at http://funeralsocial.com/blog/. Please feel free to utilize these short, information-packed articles to help you set up and manage your Business Page. I’ll close this article with a story about why it’s important to set up a business Business Page for your funeral home. Last week a funeral home owner told me he downloaded and posted our free Memorial Day video on his Facebook page. He was thrilled with the number of people who viewed the video. He wanted to know more about who saw the video: where they lived, when they viewed, etc. But he could not find the analytic data on his Facebook page that gave him the information he wanted. I then realized this is because he posted the video on his personal Profile which does not include a Facebook Insights option for viewing deeper analytic data. I explained he would need to set up a Business Page in order to access these options. While anyone can create a Business Page and implement the ideas presented above, it can be an uphill climb to get started and it can be time-consuming. If you need help, the professionals at DISRUPT Media can work with you to create and maintain an effective presence on Facebook, and also in Instagram, YouTube, and/or Twitter. We can craft a social media strategy tailored to your business using our exclusive four part FUNERAL Social Design Process. Our process is what enables DISRUPT Media to claim that we are the funeral profession’s only full-service social media management firm. Our clients who are a part of our FUNERAL Social Design Process are seeing an increase in post reach and engagement of over 300%. Go to https://disruptmedia.co to find out more about the services we offer.